The Zen Diaries of Garry Shandling is an American documentary film that premiered on HBO in two parts on March 26 and 27, 2018. Directed and produced by Judd Apatow, the film explores the life and legacy of comedian Garry Shandling. The Zen Diaries of Garry Shandling features "interviews from nearly four dozen friends, family and colleagues; four decades’ worth of television appearances; and a lifetime of personal journals, private letters and home audio and video footage." On February 6, 2017, it was reported that Judd Apatow was developing a documentary on his mentor and friend Garry Shandling. A day later, Apatow made a public plea, via his official Twitter account, for anyone with photographs, videos, or information about Shandling to reach out to him. On January 11, 2018, it was announced at the annual Television Critics Association's winter press tour that cable network HBO had acquired the documentary and planned to premiere it in two parts on March 26 and 27, 2018. On February 21, 2018, HBO released the first trailer for the film. A week later, the official poster was released as well. On March 14, 2018, the series held its official premiere at Avalon Hollywood in Los Angeles, California. The event was attended by various celebrities including Bob Saget, Kevin Nealon, Vanessa Bayer, Kathy Griffin and Regis Philbin. The Zen Diaries of Garry Shandling has been met with a positive response from critics. On the review aggregation website Rotten Tomatoes, the film holds a 93% approval rating with an average rating of 8.4 out of 10, based on 15 reviews. Metacritic, which uses a weighted average, assigned the season a score of 90 out of 100 based on 9 critics, indicating "universal acclaim". In a positive review, Newsday's Verne Gay gave the film four out of four stars and said, "Diaries is for Shandling fans, certainly, but it’s especially for any kid who might want to become a comic, or write for TV or get into this industry. Zen Diaries is a nearly five-hour-long master’s degree in “the business,” and also a sober, clear-eyed view of the risks as much as the rewards." His ultimate summation of his opinion of the film reads, "Brilliant portrait of an iconic comic, but an especially moving and human one, too." Offering similar praise, Steve Greene of IndieWire gave the film a grade of "A-" and said, "As a tribute, a eulogy, and an appreciation, The Zen Diaries is a even-handed look at someone who sought to bring meaningful change into other people’s lives as he searched for that same sense of fulfillment himself. Even if the film didn’t actually include footage from a ceremony remembering and celebrating Shandling’s life, you’d feel like you were already part of one." 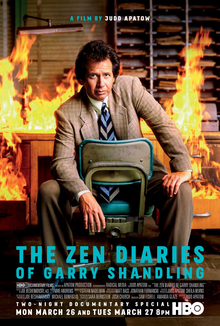 In another enthusiastic critique, The Hollywood Reporter's Daniel Fienberg said, "Presented over two nights, but easy to digest in a single sitting, Zen Diaries is a worthwhile account of Shandling's career and evolving philosophy, an insightful exploration of stand-up comedy and the comedic voice, and a sad contemplation and reckoning from those Shandling left behind and those grappling with his legacy." In a one sentence "bottom line" abridgment of his review he writes that the film is, "Essential for Shandling fans, a superb introduction for neophytes." Upon their premiere, part one of the documentary was viewed by 268,000 people and part two was viewed by 286,000 people. ^ Turchiano, Danielle (January 12, 2018). "HBO Announces 2018 Documentaries From Mariska Hargitay, Judd Apatow, Peter Kunhardt, Rebecca Miller". Variety. Retrieved February 23, 2018. ^ Wright, Megh (February 6, 2017). "Judd Apatow Is Working on a Documentary About Garry Shandling". Splitsider. Retrieved February 23, 2018. ^ Apatow, Judd (February 7, 2017). "I am making a documentary about Garry Shandling. If anyone has any great video, photos or anything helpful let me know. I am looking!". Twitter. Retrieved February 23, 2018. ^ Pedersen, Erik (January 11, 2018). "'The Zen Diaries Of Garry Shandling': HBO To Air 4 1/2-Hour Documentary From Judd Apatow In The Spring – TCA". Deadline Hollywood. Retrieved February 23, 2018. ^ Rice, Lynette (February 21, 2018). "Get a first look at HBO documentary 'The Zen Diaries of Garry Shandling' from Judd Apatow". Entertainment Weekly. Retrieved March 18, 2018. ^ Collis, Clark (February 28, 2018). "No flipping! See the exclusive poster for HBO doc 'The Zen Diaries of Garry Shandling'". Entertainment Weekly. Retrieved March 18, 2018. ^ Chuba, Kirsten (March 14, 2018). "Judd Apatow Talks Garry Shandling's Mentorship at 'The Zen Diaries' Premiere". Variety. Retrieved March 15, 2018. ^ "The Zen Diaries of Garry Shandling". Rotten Tomatoes. Fandango. Retrieved January 14, 2019. ^ "The Zen Diaries of Garry Shandling". Metacritic. CBS Interactive. Retrieved January 14, 2019. ^ Gay, Verne (March 23, 2018). "Review: 'Zen Diaries of Garry Shandling' is brilliant". Newsday. Retrieved March 29, 2018. ^ Greene, Steve (March 26, 2018). "'The Zen Diaries of Garry Shandling' Review: Judd Apatow's Doc is Like Going to a Funeral with the World's Funniest People". IndieWire. Retrieved March 29, 2018. ^ Fienberg, Daniel (March 26, 2018). "'The Zen Diaries of Garry Shandling': TV Review". The Hollywood Reporter. Retrieved March 29, 2018. ^ Metcalf, Mitch (March 27, 2018). "UPDATED with CHARTS: SHOWBUZZDAILY's Top 150 Monday Cable Originals & Network Finals: 3.26.2018 | Showbuzz Daily". ShowBuzz Daily. Retrieved March 30, 2018. ^ Metcalf, Mitch (March 28, 2018). "UPDATED with CHARTS: SHOWBUZZDAILY's Top 150 Tuesday Cable Originals & Network Finals: 3.27.2018 | Showbuzz Daily". ShowBuzz Daily. Retrieved March 30, 2018. ^ Sanchez, Omar (September 8, 2018). "Outstanding Documentary Or Nonfiction Special - Creative Arts Emmys: Complete Winners List". The Hollywood Reporter. Retrieved September 18, 2018. ^ Blyth, Antonia; Hipes, Patrick (September 9, 2018). "Creative Arts Emmy Awards Winners: Anthony Bourdain, Craig Zadan's 'Jesus Christ Superstar' Fittingly Lead Way On Night 2; 'SNL' Tops With 7 Wins – Full List". Deadline Hollywood. Retrieved September 18, 2018. ^ Giardina, Carolyn (February 1, 2019). "'Bohemian Rhapsody,' 'The Favourite' Top Editors' ACE Eddie Awards". The Hollywood Reporter. Retrieved February 2, 2019. This page was last edited on 2 February 2019, at 07:19 (UTC).